Hi everyone, I finally jumped in and ordered an XXL and am setting out to make a bench for it while waiting for it to arrive. I looked for a resource for technical drawings of the XXL but didn’t have any luck so i’m hoping someone can help please. What i’m looking for is the centre to centre spacings of the adjustable feet threaded holes as per the image attached. Any help is appreciated thanks! Thats what my tape measure reads. Many thanks John, I appreciate it. No problem. Are you making a stand with permanent allthread legs by any chance? I’m not sure John! 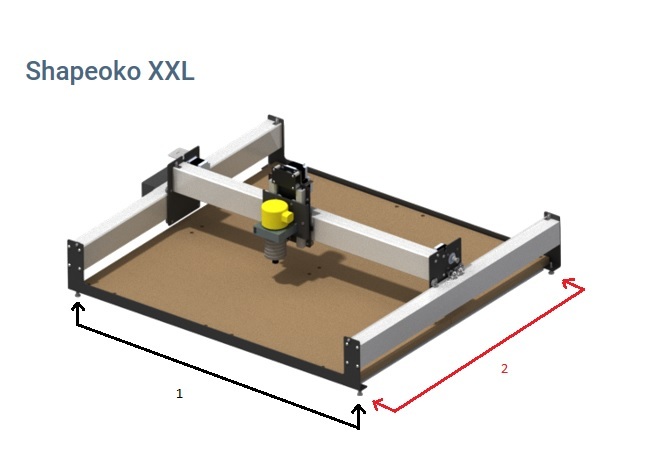 Never owned a CNC and don’t have my shapeoko yet (on its way). But while waiting I’ve decided to weld a table up beforehand so I figured I would give myself the option of being able to thread through these holes into a cross member if required.